So we had a mosey tha other night. Me and Eb be tha regular FB folks, but Yot and Altir is comin sumtimes. Also Kisa were able ta make it which were great! 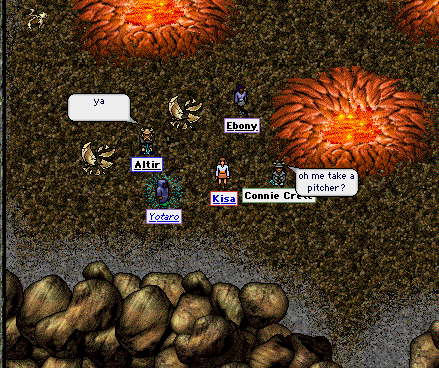 We started out with earthwurms and as there weren't so many o them ranneed out o critters after about 40 minutes. So we went ta Melly's house lookin fer a rock causn Altir wants tha ring and Kisa wants tha shieldstone necklace Hoggle says ya kin make with tha ruby necklace. Anyways, no joy there. Then we pergressed on ta toks. I figgured we could play until sumbudy got kilt too daid, but Kisa and Yot has solid horus. We ended up makin it allway ta tha tok nest and gitn tha black viper one daid. I dont general take pitchers durin tha action causn Ima concentratin on not spillin beer. Afterwards, we moseyed home and had a good evenin.